By: Batalden, Paul B., Foster, Tina C., Godfrey, Marjorie M., Johnson, Julie K., Nelson, Eugene C.
Quality by Design reflects the research and applied training conducted at Dartmouth Medical School and The Dartmouth Institute Microsystem Academy under the leadership of health care improvement gurus Gene Nelson, Paul Batalden, and Marjorie Godfrey. It's an ideal text for teaching the fundamentals of quality improvement in health care, providing a clear linkage of theory to practice. 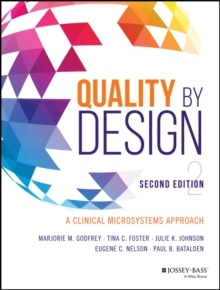 The second edition advances the clinical microsystem theory by addressing the organizational levels of macrosystems (large entities like hospitals and health care organizations) and mesosystems (intermediate levels of a health care organization, such as information systems, service line programs and centers, and clinical departments, which serve as a link between separate microsystems and support the microsystem by acting as a sort of mediator with the larger macrosytem) in more depth. Field-tested teaching techniques and tools for faculty, interprofessional improvement teams, and leaders of health care systems are presented. New and updated illustrative case studies bring the clinical microsystems approach to life.